Good transaction. No problems. Quick shipping. Highly recommended seller! Starts off but didn’t ends up great. Communication was very poor. Poor packaging, item shipped in empty box too large, damaged original packaging. Sold as new Xbox. Used system with scratches and codes already claimed. The seller is impossible to work with if anything goes wrong. Bad shiping! The seller did not respond to my message at all! Item arrived fine. I had a concern and the seller did not respond to my message. Xbox box came damaged. Zero shipping packaging. Over sized shipping box. Item was never shipped, sell never contacted me or returned my emails. Fast shipping, None of the codes for Gold or anything worked. No response. Seeing as production for the original Xbox One has stopped, I felt it was time to upgrade and stay up to date with the latest technology. I currently have a 1080p TV and can already see increasingly bright and crisp graphics. I can only imagine how this looks on a 4K screen! Loading time is reduced, I load into multiplayer games instantly while others are taking 15-30 seconds. I am an avid gamer and Xbox customer and this product helps keep me at the top of my game. Not to mention I got it for $100 below retail from Newegg. Highly recommend if you can spare the cash and want the ultimate experience. To start the Xbox One X is an incredible console. It is the third generation Xbox and I have owned all three. I have liked all the console but so far, I have enjoyed the Xbox One X the most. I have owned it for the last month and a half and only have great things to say about the console. To start the console has native 4k resolution and I have a 4k monitor to go with it. 4k resolution is a very noticeable difference compared to 1080p and most games and streaming services offer 4k content. It also has the ability to do 10-bit or 12-bit color if that is supported by your monitor or TV. For the physical design Microsoft was able to get rid of the annoying power transformer and put it internally in the Xbox. This means you just have a regular power cord now. It also has a smaller footprint but is a bit heavier in weight than the second generation giving you the impression that it has a strong build quality. With fifteen dollars stand the console looks very sleek on my desk. It has the built-in capability for Dolby Atmos and comes with Windows Sonic for free which is for virtual surround sound. If you have a headset with a MixAmp you can set it to stereo uncompressed as well. It has an IR blaster built-in which allows for you to connect a multimedia remote. I found one for twenty dollars and it works great functions just like I have a TV. It can play back Ultra High Definition Blu-Ray discs too. Microsoft has an app available in the Apple Store that allows you to connect to your console and do things like power it on and off or join in to one of your friends party. Overall there is only two negative I can think of and both have solutions they just require money. First the console gets quite hot causing the cords on the back to be hot as well. I don’t any issues will arise form this. The other is that it is only has 1TB of space, but you can by external hard drives if you filled all the space. Great system. Worth the price! 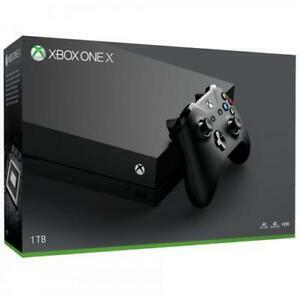 The xbox one x has totally won me over. I also have the PS4 pro, which is good, but it's not on this level. Halo 5 looks like a brand new game on 4k screens. It's pretty incredible it runs most games at a native 4k. Everything else just runs smoother when compared to my xbox one s. The other surprising thing, is just how small and quiet it is. It's a little smaller than the one s, and is insanely quiet. Very impressed with this system and can't wait to see the new games take advantage of its power.